container moved on a tilt bed truck the rate is typically around $3-$4 per loaded mile. As for the loading and unloading times, often a driver might have to wait 1-2 hours to get loaded at the depot, so this wait time is also factored into the mileage rate. Movement of 40ft shipping containers by road can be significantly more expensive than 20ft containers because they’re moved mostly by heavy tractor trailer (semi) trucks, which have much higher operating costs. Semi trucks also tow heavier trailers for moving shipping containers. These are known in the industry as a ‘Landoll’. Landoll trailers are considered to be specialised equipment, so again the operational costs are higher when compared to regular flatbed trucks or chassis trailers. 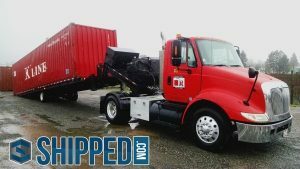 While these trucks are quite capable of moving cargo containers they’re actually designed to haul much heavier equipment, or loaded shipping containers, so hauling empty ones is light work. 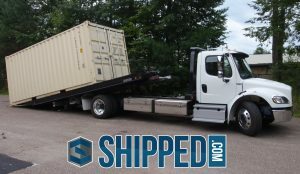 Using a heavy truck for light work is an expensive practice which can in some cases significantly increase the purchase price when buying a shipping container. When moving conex containers longer distances Shipped.com utilise Hot Shot carriers to move our containers. Hot Shot carriers typically use Ford F-series trucks or Dodge Rams. They still need to tow a large, heavy tilt bed trailer, but their fuel and overall operating costs are lower than a semi. 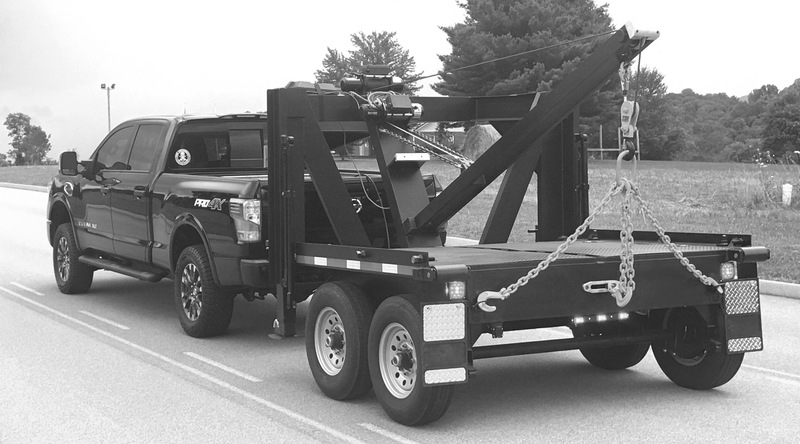 The downside is that many Hot Shot operators in North America only use flat bed trailers, which allows them to diversify the loads they can carry, so when moving shipping containers Hot Shot carriers need a forklift, container handler or crane to load and unload them. Shipped.com endeavour to offer the lowest container delivery costs to our customers, so we’re always looking for more cost effective ways of transporting empty shipping containers. One new method is by use of a product called the Dyna Dolly, or as it was previously known the ‘Texas Come Along’. The Dyna Dolly was specifically designed to haul empty 40ft shipping containers. The simple design uses a dolly which can be towed by a regular truck and then is placed under the centre point of an empty container. By using an attached winch and some jack stands the container can be manoeuvred onto the dolly and transported with ease. Empty 40ft containers weigh in at around 9,000 lbs, so a heavy trailer is not needed to support the weight of them. The Dyna Dolly is legal and DOT approved for use in all 50 states, making it ideal for interstate hot shot carriers . It’s unique design allows 40ft containers to be unloaded in just 10 minutes (using jacks and a remote) by just one operator. The cost of the basic Dyna Dolly unit is significantly cheaper than a larger landoll or Big Tex tilt or roll off container trailer, which makes it an attractive product for any entrepreneur looking for a new business opportunity. Hi Patrick, we are not selling these but you can contact the company by clicking on the words ‘Dyna Dolly’ (in blue text) within the article.